Up to a certain extent I have enough music by DeWolff in my life. It is fairly fair to state that a new album by the band delivers more of the same. It was there where the previous album 'Grand Southern Electric' surprised me. With its more southern rock oriented and to the point songs it did things in a different way. 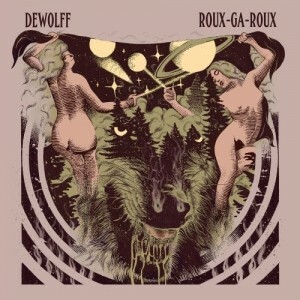 'Roux-Ga-Roux, something with werewolves in France, is a reaction to this album. The band started its own recording studio in the depths of Utrecht's canal vaults and played until it was happy with what was going on. This led to a few more pointed songs and a few jams. Sounds like the best of both worlds, right? Live DeWolff is unsurpassed. The two times I've seen the band play, electrically charged is the best description for those evenings. A machine that grooves, rocks and jams. This is a quality that is hard to catch on record. So why not forget about that? There is the recording band and the live version of that band. Both have their qualities and Roux-Ga-Roux certainly is a proponent of the former. In DeWolff a whole generation of dead and (almost) pensioned off musicians of the early 1970s come back alive. The organs of Jon Lord and Ken Hensley are in the fine hands of Robin Piso, the melodic and harmonic turns are taken care of by Pablo van der Poel. The trip to the south of the U.S. was not totally in vain as The Black Crowes are remembered in 'Baby's Got A Temper', where hardrockers of the 70s meet the retro rockers of the 90s. Let's face it, DeWolff are not the best songwriters in the world. It doesn't touch the level of the best songs Deep Purple, 'Speed King, or 'Child In Time' or Led Zeppelin, a lot of songs, came up with in their day. But let's face it once more, not everything by Deep Purple is extremely good. This level the band touches on easily and what wins me over, is the fact that it is able to make its songs come alive in almost every instance. Be it through the addition of female vocals, horns or a spacey organ or guitar solo, something special happens that adds to the quality of a song. The vocal melody of 'What's The Measure Of A Man' may not be the best on Roux-Ga-Roux, when the band goes off, guitarist Pablo that is, everything starts sparkling. What the band is also great in, is letting a song take a totally different turn. Changing the pace, the feel and direction at the same time. DeWolff is not afraid to show where its experimentation in the studio took it, without losing any focus on the core of the music: the song. The trio, extended by guest bass player Joep Bollinger, consists of three fine musicians, where I must not forget to mention drummer Luka van der Poel, who keeps the songs going under all circumstances and has started singing as well. Pablo van der Poel's voice is ripening also. The David Byron howl is getting within reach, something that adds to the flavour in the singing. 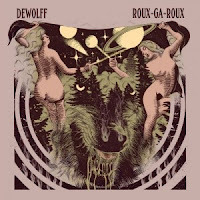 Summing up, yes I like DeWolff live better like most people do it seems, but having said that, just like 'DeWollf IV' and 'Grand Southern Electric' I will play 'Roux-Ga-Roux' often as well. The band gets better and better in capturing what it is exceptionally good at in its songs. So if I wrote that DeWolff are not exceptional songwriters, let me add here that it may only be a matter of time before they do reach that level. 'Stick It To The Man' aims for 'Woman From Tokio'. On the next album we may hear one. I am not 100% certain yet, but in a while I may be of the opinion that Roux-Ga-Roux is a better album than 'Grand Southern Electric'. I love following its bends and queues already.